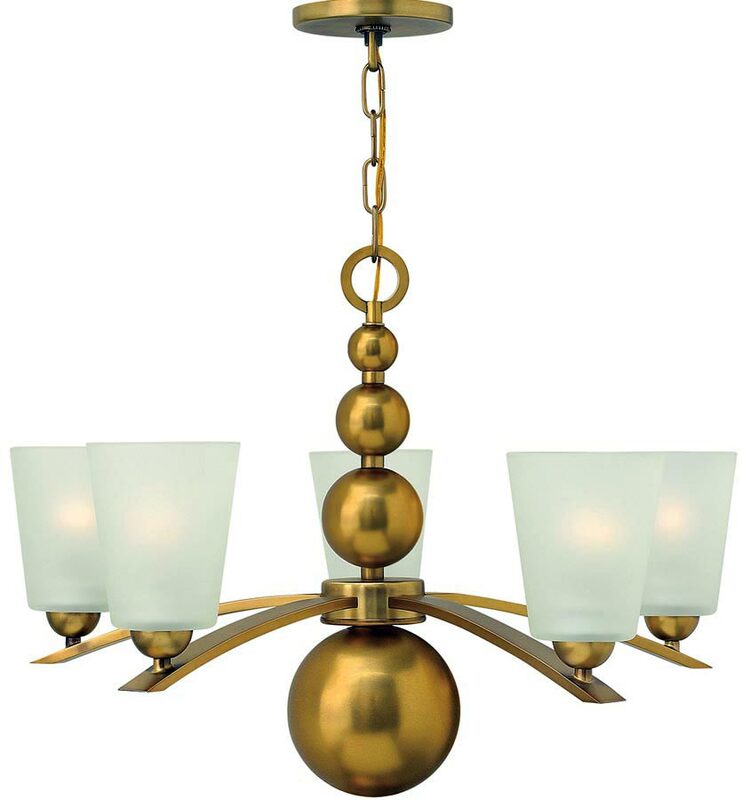 The Hinkley Zelda 5 light chandelier in vintage brass finish with etched glass shades is contemporary and features a circular ceiling mount and chain suspension connected to a large top ring. The chandelier body is decorated with mellow brass spheres that get progressively larger as they descend. Five sleek flat section bowed arms gently curve downwards from the centre and are fitted with tapered etched glass shades perched on hemisphere cups for a diffused light. A larger lower finial sphere finishes the design off nicely. Perfect for the modern living room, dining room or bedroom. Supplied with 150cm of chain that can be shortened at the time of installation by removing links. Minimum height 56cm, maximum drop 206c. Part of the Zelda modern lighting collection finished in vintage brass that can be viewed below and includes a wall light, a semi-flush fitting, various sizes of pendants and seven and eight light chandeliers. Designed in the USA by Hinkley Lighting, founded in 1922 in Cleveland, Ohio. Their long heritage combines with a pursuit of innovative design to create modern and contemporary lighting such as the Zelda 5 light chandelier in vintage brass finish with etched glass shades featured here.